No I haven't gone all Commander Data on you, this is the next step in the, what I am still assuming is unofficial, ARG that surfaced about a month ago. Today we were sent an email, presumably for signing up after completing the memory game puzzle, this email gives details of what is going to happen next. 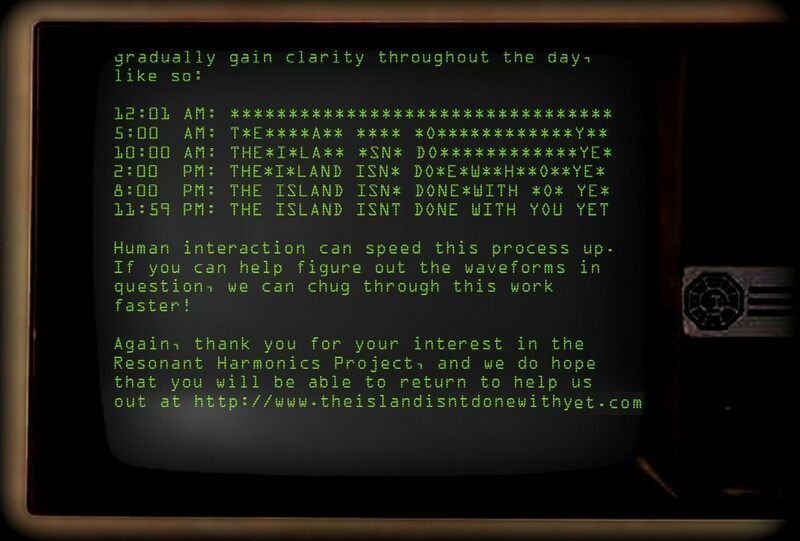 Returning to the website www.TheIslandIsntDoneWithYouYet.com shows the same information on a scrolling screen. Looks like there will be 15 puzzles starting tomorrow, whether this leads to anything or there are any prizes is unclear, but it might be a bit of fun. Thank you for your interest in the DHARMA Initiaive Resonance Harmonics Project. 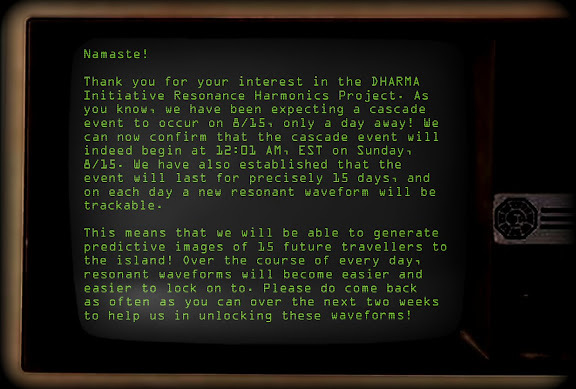 As you know, we have been expecting a cascade event to occur on 8/15, only a day away! We can now confirm that the cascade event will indeed begin at 12:01 AM, EST on Sunday, 8/15. We have also established that the event will last for precisely 15 days, and on each day a new resonant waveform will be trackable. This means that we will be able to generate predictive images of 15 future travellers to the island! Over the course of every day, resonant waveforms will become easier and easier to lock on to. Please do come back as often as you can over the next two weeks to help us in unlocking these waveforms! Human interaction can speed this process up. If you can help figure out the waveforms in question, we can chug through this work faster! 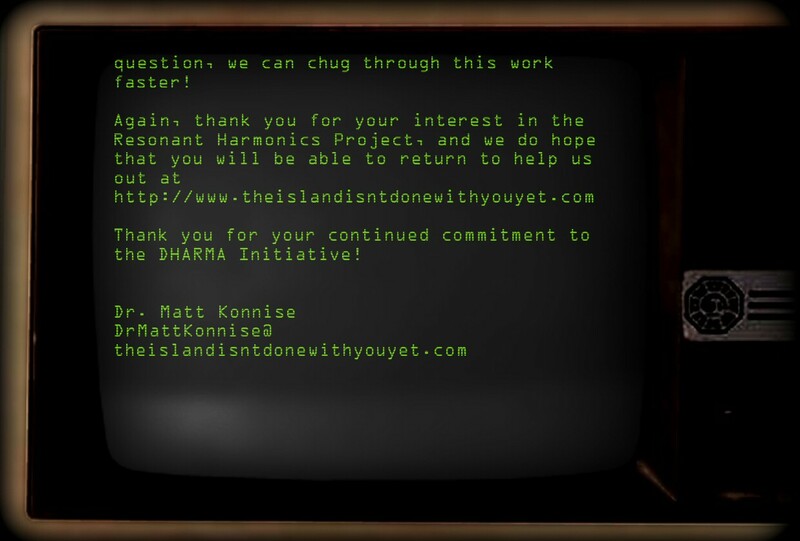 Thank you for your continued commitment to the DHARMA Initiative! lol I just happened to catch it. Off to the air port to drop off another puppy. The meteor shower last night was amazing ! I'm afraid any meteors were hidden by thick clouds here. What do you mean by "drop off another puppy"? lol we have our puppies up for sale and one was going to fly out to California today but they said it was too hot so she goes out tomorrow. I drop them off at the air port in their crate and they ship them across the country to the new owner. Interesting. I'm in. Maybe I can actually figure out what its saying before it's done. Oooohh.. That's cool. What breed? I always wanted a dog but I'm a pretty irresponsible person and I don't trust myself that I can look after them. Maybe sometime in the future... Is your eye feeling better, Lisa? I'm excited to see where this goes! Got that email late last night! Exciting...something to talk about again! @thaeagle2003: I did not receive an email saying they got the preregistration. I did get one about being in the first 100 and the free tickets. thanks for asking Jason, it's very frustrating to not be able to see well. I can see why they say this is the one symptom that people notice. Right now they think I have MS so I've had every test imaginable. Its upsetting mostly because I can't see right- I think I've walked into 3 people this week and into a glass door. I wish it would just go back to normal ! @Lisa- hope everything gets solved and that it's nothing too serious! Did you sell the female merle with the more spots? That's the one I would love to have, but we just don't have a big enough yard to have two big dogs. Kills me to look at the pictures though. They are SO cute!! Guess I missed the registration for this ARG, but at least I'm ready to solve wavelengths!! thanks Scoutpost, yeah I'll be glad when it's figured out and done with. we shipped that pup out yesterday to California, she was the first to go since she was so flashy. I just have to two boys left now. I hope this game isn't too hard. I'm looking forward to some new Lost stuff. yeah ! wow, Lisa, hope things improve for you! Scoutpost, I missed the registration for this ARG, too. I'm actually glad that this is a fan-made thing and it's done really well, IMO. It seems like anything else happening with Lost now is all about stuffing the pockets of ABC, LOL! ((waving)) Hi maven & MadAriad! I'm sorry to hear about your continuing eye trouble Lisa- was wondering how you were doing. I hope it all improves for you! Eagle- I got an email for day one, and none for two- but under my profile at the auction site it shows approved for both days. I didn't fax in registration- just signed up online. I've been through the catalog many times now- but my "really like that" stuff is going to be too much, and the "would like to have it" is also too much for that category of wanting. Anyone have an idea of what it would cost to ship a 3 ft by 8 ft polyfoam panel to NH? - I would guess from Hawaii. I also think Dogen's costume is pretty neat- but what would I do with it? Oh- and I wanted to ask- did anyone else miss in the show that Hurley got his flash sideways numbers from a dollar bill he found, and that they were different from "the numbers?" I saw those props for sale in the catalog and said- when did that happen? Then I saw someone on LP thinking the same thing. Was it in the video at the museum awards? And also- MIB's name on Titus chair is "Samuel"? I guess that's been floating around for awhile- but what was the point of making a secret of it I wonder? i heard that samuel was the character name on the audition paper. if people were auditioning for a role and didnt have a name it would raise some eyebrows. i too dont remember the other numbers. How come there was never a post for the KATE AND CLAIRE poster by Taylor? The first wave is up! It's a test run, I think. Is anyone else having trouble with donating???? Every time I try to log into paypal, I click continue and it pulls up an error report! Is there anyway to fix this or something? Maybe donation function has been disabled. Something to do with donations and fees. Wasn't there an issue with that awhile ago? Haiti donations...? I know very little about paypal, sorry. lol...the wave-game was set-up just to sell something? Oh, brother. Well, I have put SPOILER on my comment. I didn't give the answer to the "puzzle", just where it takes you. I will delete if needed. The thing is, is that I've been trying to donate ever since the post, and I can't. I've tried credit card too, and I keep getting the error page. Did the charity send you to paypal for donations? If so, contact them and ask where you can send a cashiers check/money order via snail-mail. Or...there has to be a "contact us/support" button somewhere at paypal. I've only made a couple of transactions there...not really that familiar. BTW...it was very generous of you to set the sale up for charity. A very nice thing to do. "We're Either In The Past Or We're In The Future"